Atmospheric chemistry is an applied field of chemistry that deals with the chemistry of our atmosphere, including sources, sinks, transport, physical and chemical transformations in solid, liquid and gas phases. It is an interdisciplinary field that requires knowledge in the core sciences; chemistry, physics, mathematics and biology and additionally may require one to have knowledge in other sciences including meteorology, geochemistry, and oceanography. Enabling fields include analytical chemistry (especially development of instrumental methods of analysis), physical chemistry (especially thermodynamics and kinetics), and computational chemistry (especially mathematical methods used in computer modelling). Areas of research interest in atmospheric chemistry include urban, regional and global oxidant formation, aerosol formation, photochemical smog, acid precipitation, stratospheric ozone depletion, global & regional atmospheric change, arctic pollution and airborne toxic chemicals. Two spectroscopic methods are used in our research to measure small molecules in the atmosphere that have characteristic absorption signatures in the UV-VIS portion of the spectrum. They are active-DOAS and MAX-DOAS. The conceptual difference between the two systems is that the former uses an artificial light source (active) to determine the concentration of absorbers along a well defined path length, L, while the latter uses solar scattered radiation (passive) to determine the slant column density of absorbers (molecules cm-2) along a path that is not so well defined. The advantage of the latter is that it has the potential to yield information on the vertical distribution of absorbers and aerosols in the atmosphere above the surface. We currently have instrumental systems and software capabilities for both these. A brief description of the two methods follows. The solution to the multiple absorber problem then becomes one of performing a linear least squares fit of differential cross sections, s(l), to incoming differential absorption spectra, Ae (optical densities, D) to yield the number densities of absorbers, ni;, with knowledge of the path length. Active DOAS can be used for night time studies, in contrast to passive systems based on solar radiation. An active DOAS system can be used for the measurement of a range of small molecule absorbers in the UV/VIS (i.e. - NO2, NO3, HCHO, ClO, BrO, and BTEX). Night-time chemistry continues to be of interest, especially in polluted marine environments such as the Lower Fraser Valley on the west coast of Canada. 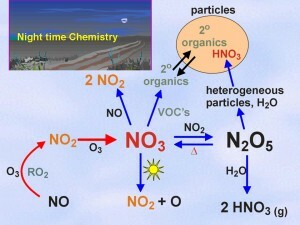 NO3 and N2O5 are known to be implicated in night-time oxidation and particle formation mechanisms, but it has become clear in recent studies that heterogeneous reactions on marine aerosols can also activate chloride to chlorine atoms, which can provide a morning source of radicals in the urban area, enhancing ozone formation. 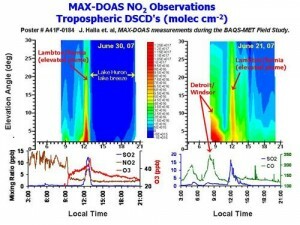 Multi-axis DOAS (MAX_DOAS) can be used to measure vertical distribution of trace absorbing pollutants (UV/VIS), to quantify total and tropospheric vertical column densities, and in association with radiative transfer modelling, to measure total aerosol optical depths and aerosol layer depths (~ boundary layer depths). A project continues in the use of MAX-DOAS to achieve these objectives for NO2, HCHO, O4 and aerosols. In addition, MAX-DOAS measurements can be used for satellite validation studies and model validation studies. 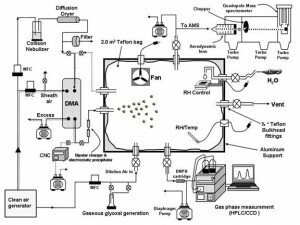 A sensitive gaseous carbonyl measurement system has been developed and deployed in several field studies including the recent BAQS-Met field study in 2007. 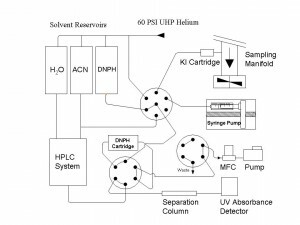 (include pic) This system, the only one of its kind in Canada, can continuously measure a range of gaseous carbonyls with low part per trillion detection limits using a 2 hour cycle time. The system is used in studies aimed at furthering our knowledge of the sources and sinks of a range of volatile carbonyls such as C1-C7 aldehydes and ketones as well as the important class of a-dicarbonyls (glyoxal, methyglyoxal, biacetyl) Carbonyl compounds are important since they are generated in large quantities in the global atmosphere by photochemical oxidation of volatile organic compounds. They are indicators of secondary oxidation chemistry, they are a source of free radicals to the atmosphere and more recently have been implicated in the formation of secondary organic aerosols through their heterogeneous reactions on pre-existing aerosols. In a collaborative project with Environment Canada, a 2 m3 reaction chamber was built to study heterogeneous reactions of carbonyls, in particular glyoxal, on seed aerosols. (attach pic). The kinetics and mechanisms of these reactions are studied with an Aerodyne aerosol mass spectrometer (AMS), that can follow the chemical composition of the aerosols in real time as the experiment proceeds. These experiments were successful in providing the first documented evidence for the formation of organic sulfates in the particulate phase, and in providing evidence for the rapid uptake of glyoxal on inorganic seed aerosols of various types and the formation of higher order oligomers of glyoxal in the particle phase.